It’s breathtaking, almost painfully beautiful in the Willamette Valley in Oregon right now. My mother and I, every fall on day’s like today, talk about this time of year in that–so-beautiful-it-hurts kind of way. The air is different. 75 degrees in late September does not feel like 75 degrees in early August. Colors are more intense and the light has shifted enough to feel almost wistful in its beauty. Work is busy, school and sports schedules are all over the map and produce is abundant. Those intense colors reflect my general feeling this time of year. . .. immensely grateful for all I have and slightly on overdrive to preserve all that accumulated sunshine for the cooler months and take advantage of the waning summer produce on our plates every day. 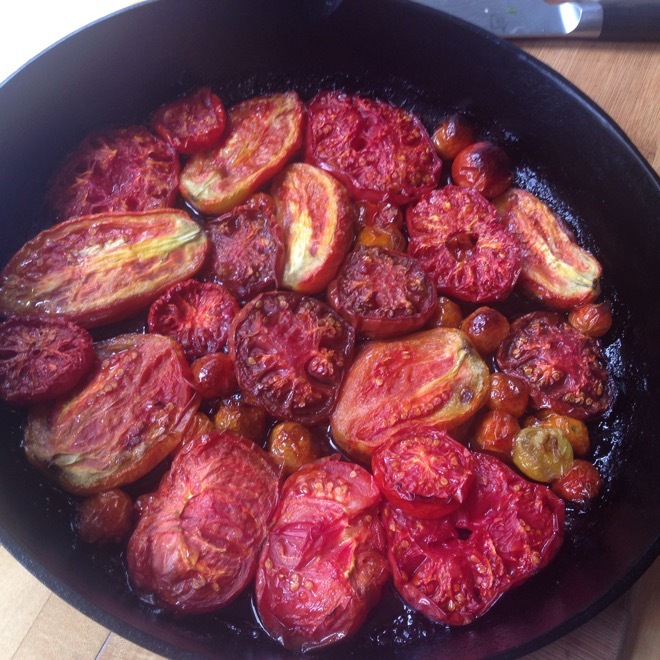 I roast batches of tomatoes with salt and olive oil; sauce types, slicers, cherry types, all in the same pan because it works just fine. I may use some to dress a pasta dish or spread on sandwiches or stir into a soup or I may freeze the whole batch, in pint size containers, for less intense times. I’ve also been making one of my favorite dishes from my time in Southern Italy (Calabria) 25 years ago. It’s nothing more than potatoes and sweet red peppers pan-friend. 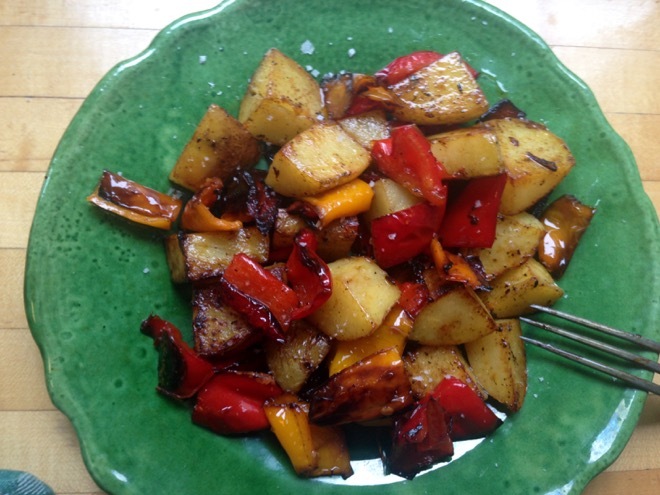 The peppers are a sweet and smoky and the potatoes both creamy and crispy and plenty of sea salt keeps you eating this simple concoction beyond your better judgement. Sweet, salty and a bit charred . . .This was one of my very favorite things to eat when I lived in Calabria (the toe of the Italian boot) 25 years ago. It doesn’t really get any simpler but you need to be brave with the heat and have good ventilation. And don’t skimp on the oil either. 3-4 medium firm fleshed yellow potatoes, well scrubbed (no need to peel) and cut into bite-sized chunks. Heat the oil in the largest, heaviest skillet you have. When it’s hot but not smoking add the peppers and potatoes and toss well to coat with oil. Cook on high heat, stirring frequently until the both potatoes and peppers are tender and almost blackened around the edges. Season liberally with sea salt. Serve hot. Cook With What You Have. . .
Posted on September 16, 2015 | by cookwithwhatyouhave | 2 Comments on Cook With What You Have. 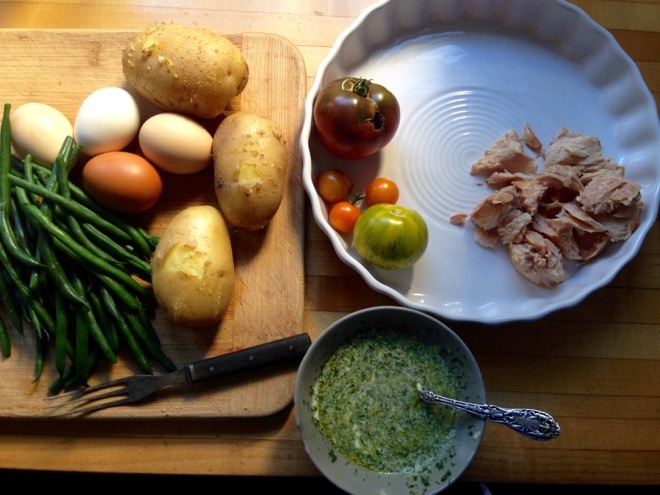 . .
No olives, no lettuce, not a traditional vinaigrette (and herby green sauce thinned out with mayonnaise), but the makings of a great Nicoise Salad a la cook with what you have. I’ve been testing recipes on my Seasonal Recipe Collection that do not have photos. They don’t have any, either because I wrote them long before I launched this part of the site and was not so focused on images, or in some cases because I wrote the recipe without actually making the dish. Yes, there are a few of those on the site . . . I only write and post recipes I know will stand a very good chance of working and being tasty (though people’s tastes do vary widely) even if I haven’t made the dish exactly as written. It’s been so fun to work my way through the site as vegetables come into season and I take advantage of testing as many things as possible with, say Anaheim or poblano peppers or escarole or beets. 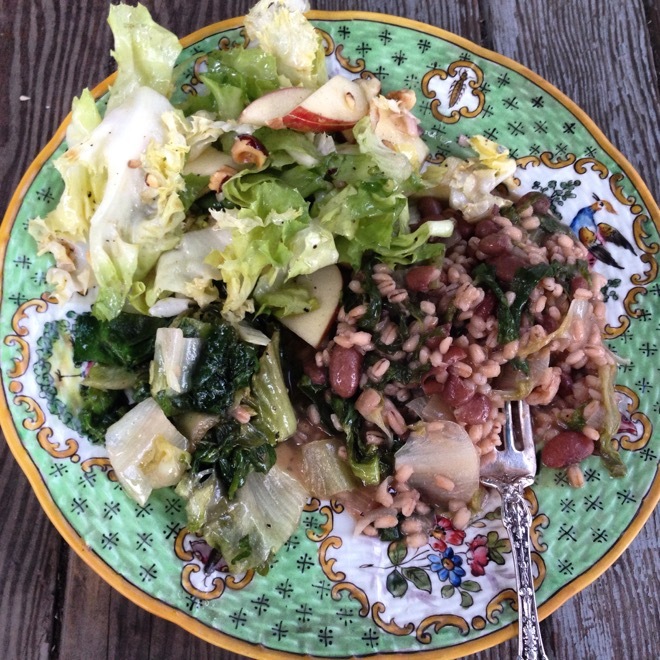 Last week we had escarole three ways for dinner–wilted; in a barley risotto with red beans; and in a salad with toasted filberts, apples and blue cheese. I’m often able to make three, sometimes four dishes in one afternoon and get them photographed and the recipes edited and images uploaded before I go to bed. My point is, cooking through recipes that I wrote this time of year (in years past) does not mean lots of trips to the store. I stumbled upon shelling beans at my local market recently and remembered that I had several dishes with shellies that needed re-testing and photographing. I headed home and tested an old pasta dish (inspired by a decade-old Pastaworks newsletter) with a shelling bean, tomato, bacon and basil sauce. The tomatoes and basil were in the garden, the bacon in the freezer and the pasta in the pantry. Yes, the original recipe called for fresh egg tagliatelle and pancetta but a box of penne pasta and a few slices of bacon from the freezer were perfect. Make it your own–all of it! Use the herbs you like or have growing in the garden, skip the lemon and use vinegar. . . whatever it is just make something! And if you haven’t subscribed to the Seasonal Recipe Collection you might check it out. . . it is getting deeper and more colorful everyday and should have some inspiration for everyone! 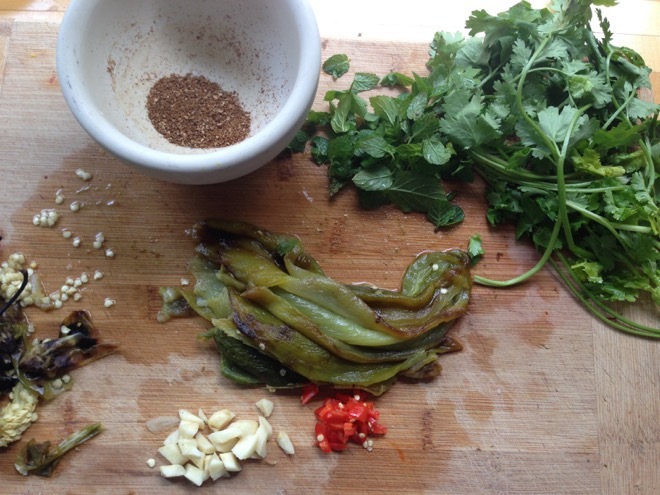 Making a green “harissa” just to see what it might be like. It is delicious. Toast the seeds in a small, dry skillet for about 2-3 minutes on medium heat until fragrant and a shade darker. Put the seeds in a mortar or spice grinder and grind fairly finely. When the roasted peppers are cool enough to handle, peel and deseed them (or leave the seeds in for more spice) and roughly chop. Chop the fresh (un-roasted) Serrano as well. Put all the peppers in a food processor with the garlic, herbs, ground spices, oil and salt. Process until smooth. Taste and add lime/lemon juice to taste. Store in the refrigerator for up to a week. 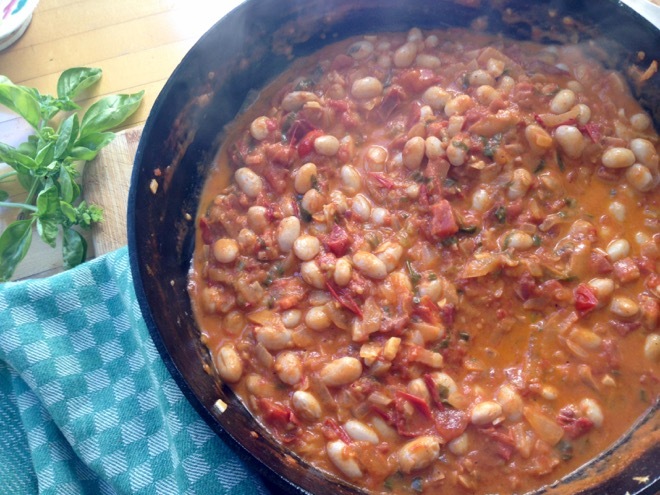 Serve it with meat, fish, eggs, grains, beans or any way you would use regular harissa.